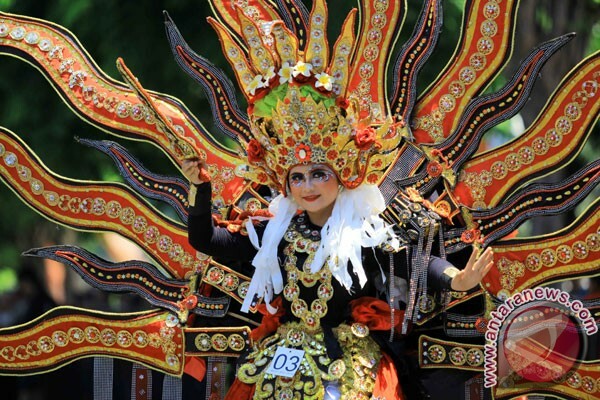 The Tourism Ministry has awarded Banyuwangi District as the best festival city in Indonesia. Tourism Ministry Arief Yahya gave the title to Banyuwangi, while lunching Banyuwangi Festival 2017 in his office in Jakarta on Friday, the Banyuwangi administration said in a statement here on Saturday. "Judging from various festivals organized in Indonesia, I declare Banyuwangi as the best festival city or the best festival organizer. Banyuwangi ranks first," Yahya was quoted as saying in the statement. Since 2012, Banyuwangi has successfully organized annual festivals. Besides, the implementation of the annual festival has improved quantitatively and qualitatively, the minister asserted. This year, Banyuwangi has planned 72 activities to enliven the 2017 Banyuwangi Festival. He lauded Banyuwangi for organizing the annual festival that helps in preserving the local culture and traditions and boosting the local economic conditions. Thanks to the festival, Banyuwangi dubbed as "the Sunrise van Java," has attracted some 80 thousand foreign tourists and 3.2 million domestic tourists last year. If every foreign tourist spent an average of US$500 per visit, Banyuwangi would earn some Rp500 billion in total. "For domestic tourists, the average spending is Rp1 million each. So from domestic tourists, the earnings could reach Rp1 trillion. Hence, money circulation from tourism is Rp1.5 trillion in Banyuwangi," he added. He suggested that Banyuwangi promotes maritime tourism, as foreign yachts could generate a lot of income. "If some 1 thousand yachts visit Banyuwangi, we could earn at least Rp1 trillion from their spending," the minister stated. On September 15, 2017, Banyuwangi will organize the Banyuwangi Sail Yacht Festival as part of the annual festival.